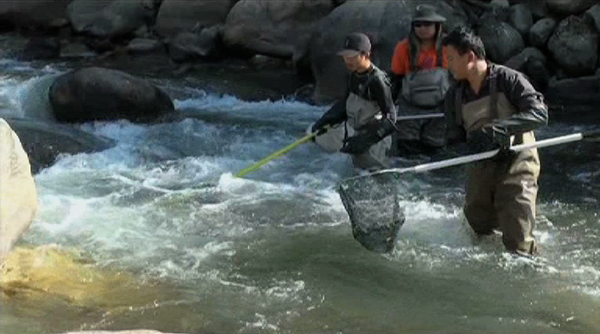 Bhutan will soon have a detailed data on fish species in the country. The National Research Centre for Riverine and Lake Fisheries in Haa is currently collecting the specimens from rivers and streams in the eastern and central part of the country to study the diversity and fish in the country. Recently, the officials from the National Research Centre for Riverine and Lake Fisheries (NRCR&LF) captured fish samples from a stream that joins the Gamri Chhu in Rangjung in Trashigang. The small portion of the fins is cut off and placed on a card called FTA with the information, which will be sent abroad for a DNA test. The fish are then released back in the river. A similar study has been already conducted in the western part of the country collecting samples from Amochhu, Wangchu and Punatsangchhu during its first phase of the project. “So far, there is no proper database of fish in Bhutan. Therefore with funds from Bhutan Trust Fund for environmental conservation, we are carrying out the second phase of the project,” Sonam Dorji, the Laboratory Officer of NRCR&LF, said. Besides the data, it is also expected to help in planning and coordinating any developmental activities without having an impact on the aquatic biodiversity. “In the past, without any proper data and information about fish species many hydropower projects were constructed and some fish species might have gone extinct. Now with the database, we are collecting, we hope that it will help in planning the construction of any hydropower projects in the future,” Sonam Dorji said. The project, which began in 2016, with more than Nu 12 M funds from BTF for environment conservation will end by June next year.